Take a sweet stroll down memory lane with our Candy Wrappers Jigsaw Puzzle. 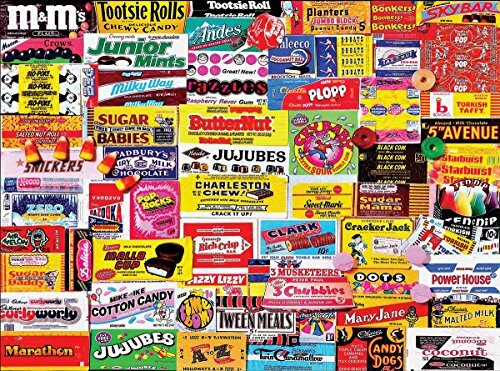 One of the best sellers at White Mountain Puzzles, the Candy Wrappers makes a great gift for both young and older candy lovers. Featuring a collage of timeless candy brands, this colorful jigsaw puzzle will bring something to the table for all ages. 1000 pieces of fun and entertainment everyone can enjoy! This exceptional piece is one of artist Charlie Girard’s finest contributions to our collection and a customer favorite. Charlie Girard, the creator of fantastic, fun, and unique collage puzzles, has become one of White Mountain Puzzles’ most popular puzzle designers ever with his seemingly endless supply of ideas and creativity. Art jigsaw puzzles are a fun and inexpensive way to enjoy beautiful works of art first hand! Jigsaw puzzles are also used to boost cognitive skills; develop hand-eye coordination, fine motor skills, problem solving, shape recognition, memory, and task completion. The White Mountain Puzzles – Candy Wrappers includes 1000 unique interlocking pieces made of sturdy blue chipboard on recycled paper. Extra large sized pieces for easy handling. Completed puzzle dimensions: 24 x 30 inches. Every White Mountain Puzzle is proudly manufactured in America with a 100% customer satisfaction guarantee.